As an avid outdoorsman, I have always wanted my soon to be 18-year-old son, Carson, to take a liking to the outdoors as well. I wanted the opportunity to hunt, fish, and snowmobile as father and son; to take these opportunities and simply enjoy what God has created. Be granted yet another opportunity to create memories that we would both be able to cherish forever. After years of sharing my hunting and snowmobiling stories with Carson, he has slowly begun sharing those same interests. This past January, we went on a father and son snowmobile trip at our lake home in Northern Minnesota and after four days of playing in the powder and riding hundreds of miles, I have him hooked. He now looks forward to those white flakes falling from the sky so we can ride once again. Having him excited to snowmobile was a definite score for me but I was excited to see if I could get him hooked on another one of my favorites – big game hunting Rocky Mountain Elk! For the past four years, Carson and I have attended the local Rocky Mountain Elk Foundation Fundraiser. I will admit, he begrudgingly attended with me the first year as he was almost certain he would be bored. But four years later and he was looking forward to the event and to his first big game hunt for my favorite big game animal, Rocky Mountain Elk. When Carson and I first talked about going on an elk hunt together, he wasn’t completely sold on it. He was concerned about several things including the length of the hunt, whether he would get a good enough shot to actually harvest the animal, and how rigorous the actual hunt would be. So you can imagine my excitement when he shared that he was finally interested and ready for his first big hunt. Together we started prepping. We went to the range to get him comfortable and confident shooting at long distances with a high powered rifle. We spent time hanging out watching elk hunting shows and talked about what would relate to our future hunt together. 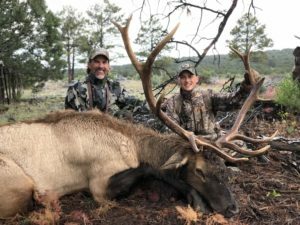 Finally, this past month – we ventured to Southwest New Mexico for their youth elk season. The first night we arrived, our guide took us out to do a little scouting in hopes that Carson could hear his first bugling bull elk in the wild. Within minutes of getting to the scouting ground, he saw several cow (female) elk and heard his first bulls bugle from nearby. His excitement was palpable as he stated: “there is no way I’m going to be able to sleep tonight, Dad”. The next couple of days were absolutely amazing. Carson experienced first hand what drew me and so many other hunters to this amazing sport. He passed on a couple of mature bulls on the first and second day as he was beginning to question whether or not he would be successful in harvesting a bull. His patience was tested and I had to encourage him to not get frustrated and continue to wait for his opportunity. Finally, on the morning of day three, he made an excellent shot at 325 yards and harvested his first trophy 6×6 bull. To be right at his side, witnessing how calm he was in waiting for that perfect shot after waiting for what seemed like an eternity was so incredibly rewarding for me as a parent. Watching him walk up to his first bull elk after harvesting it is something I will remember and cherish forever. As you can see from the smiles on our faces – this is a memory of a lifetime for both of us. I am beyond excited that he is hooked on another one of my favorite activities and I look forward to enjoying this wonderful sport with him for many years to come. I share this story with you not to push or force your children into doing what you like. But instead, to give them the opportunity to experience and take interest in your “likes” on their own. Be patient. Give them time. Talk about your interests and eventually, they may begin to enjoy and share your interests so you can experience them together. Almost 18 years later and I am excited to have a snowmobile and elk hunting partner for life!